There’s nothing like the Holiday season to give good cheer, warm receptions and a whole lotta stress. 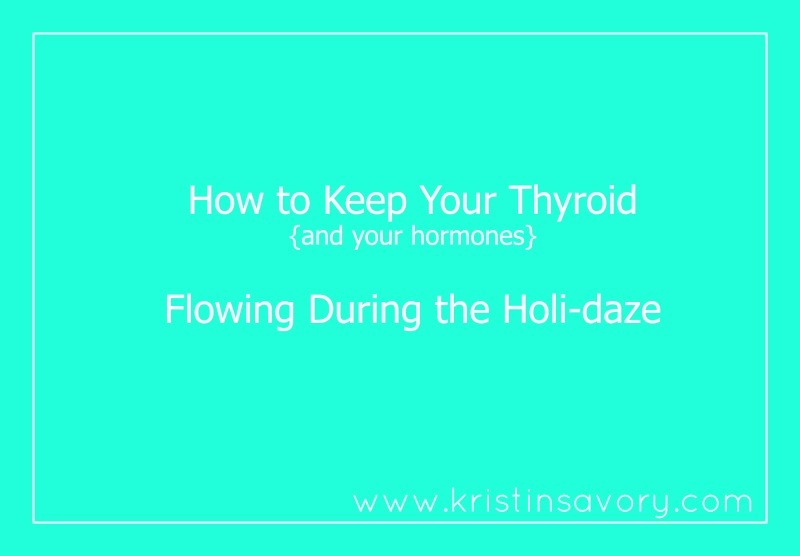 For women with a low-functioning thyroid this time of year can be particularly tricky. and leave us feeling a bit wiped out and exceedingly exhausted. The thyroid gland is a butterfly shaped gland found just below the Adam’s apple. Just like a butterfly- it’s a sensitive one. The thyroid is sensitive to both internal and external stresses. to different foods and to over-doing. low-functioning thyroid having a warm one is just the ticket. simple scrambled eggs, or some warm chicken soup to get you going in the morning. 2. Schedule “ME” Time: It’s impossible to stay sane without getting yourself on the “To-Do” list. someone else’s needs, it is absolutely necessary to take care of yourself. Give yourself some TLC by scheduling it in. Whether it’s a hot bath or a crisp walk, get yourself on the list. of “not being good enough” is a downer for you, your hormones, and your health. and replace it with kind thoughts.Find one thing that you love about yourself and highlight it. will do your attitude and your mojo a big favor. a social night, but make sure that you check in early on the other nights during the week. The darker months are tough on a low-functioning thyroid for two reasons: it’s cold and there’s not as much sunshine. Getting good rest will help one other important gland in your endocrine system: your adrenals. Strong adrenals pave the way for a healthier thyroid. because it’s easy. Saying “No” to what you don’t want is a big deal for thyroid types. But here’s the real trick. and maybe even a little practice and go for the “N-O” when you mean it. at a piece of cake. Parties are meant to bring people together to have fun and celebrate. Make the party about the people and let the food be the icing of the event. and at others you might want to have some. Be in the moment and be true to yourself. pleasurable in the moment. Less Guilt equals more freedom. More freedom is less stressful. Less stress helps your hormones every single time. make sure to leave a comment. I love hearing from you. Here’s to spreading the cheer and let the Holiday season roll! 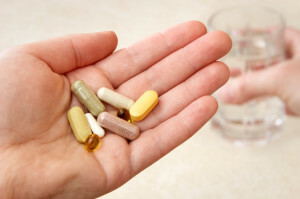 Supplements: Could They Be Harming your Health? I don’t know about you, but I grew up in the “Flintstone generation”. and tiny, rainbow-hued Pebbles and BamBam in the other.I was hooked. I wasn’t always able to eat the perfect diet. I’d heard about poor soil quality lowering the nutrient quality of foods. I had a deep faith that I needed supplements to be healthy, dating from my Flintstone era. 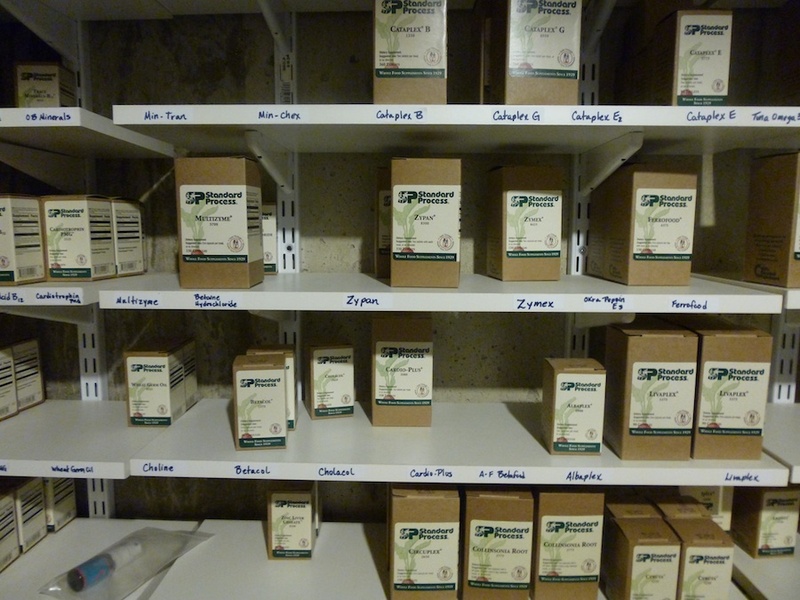 I took supplements all throughout acupuncture school and during the first few years of my practice. And although my life was grand, I was getting sicker all the time. I had a cycle for three months straight. I wasn’t exactly the picture of good health. Keep in mind that at this point, I was rockin’ a diet based on Sally Fallon’s cookbook, Nourishing Traditions. I was eating home-cooked meals of grass-fed beef, lots of veggies, and even a good amount of fermented foods. Nutritionally speaking, there was no reason that my health should have been failing. I started wondering about the supplements I was taking. We don’t hear much discussion about synthetic supplements. Even as a health care professional, I assumed the nutrients in the high-end brand of supplements I was taking—and selling to patients—were extracted from a natural source. The Vitamin C (ascorbic acid) I was taking must have been from oranges or some other food, so that it was in a form my body could easily absorb. There’s a big difference between nutrients from whole foods and the nutrient ingredients used in the vast majority of supplements. After all, supplements are a billion- dollar industry aimed at maximizing profit. 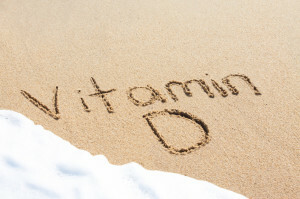 With modern day marketing, many popular supplement recommendations, from the necessity of a daily multi to high-dose vitamin D, are being sold to us. Take a carrot for instance. Carrots are loaded with nutrients. Bigwigs like beta-carotene (a precursor to vitamin A) and ascorbic acid (vitamin C), as well as lesser-known players like folicin and mannose. In fact, scientists have isolated about 200 nutrients and phytonutrients in the humble carrot. These 200 nutrients work together in mysterious ways. The little guys help get the big guys and vice versa, There are enzymes, coenzymes, co-vitamins , minerals, and other factors that help the nutrients work together synergistally. Scientists don’t know how all this works, and they probably never will. It’s the magic and mystery of nature. Take a look at the standard multi-vitamin label. We’re content when we see 20 ingredients listed in high percentages. Now think about that carrot again. There’s over 200 known nutrients in that carrot. Foods are complex in their nutrients because nutrients need each other to be properly absorbed and integrated into our bodies. In our culture, we’re used to the idea that “more is better.” If beta-carotene is good for the eyes, then a whole bunch of beta-carotene must be really good for the eyes. This type of thinking is not how Mother Nature works when it comes to nutrition. Foods are balanced. Foods are loaded with lots of nutrients but never in megadose quantities. You’d be hard-pressed to find a food with 1,000 mg of ascorbic acid, let alone the 5,000 mg–10,000mg doses often sold at stores or from health care professionals. to mean they are less effective, not as powerful. Unfortunately, the "more is better" philosophy is far from nutritional truth. more functional, powerful, and effective nutritionally than a large amount of a chemically pure, vitamin fraction. In the case of nutrition, “more” definitely isn’t better. So where are supplement manufacturers getting the nutrients to make their pills? Most of what’s being sold to us (even the supps with the healthy folks and rainbows on the label) are chemicals, repackaged in creative ways. Most supplements contain mega-dose vitamin isolates without their little guy partners, also known as vitamin fractions. Others are simply chemical compounds made in factories, also known as pure, crystalline vitamins. Both are synthetic and both are a detrimental to long-term health because they’re man-made, not nature-made. Mother Nature knows best. Nutrients need each other to work effectively in our bodies. The big guys need the little guys just as much as the little guys need the big guys. When we take supplements in high doses or in isolation from their natural counterparts, there will be consequences. Initially, our bodies might do well with these synthetics because of our extreme deficiencies. But over the course of time, synthetic vitamins can create even deeper deficiencies. But perhaps this story of a medical doctor held captive during the Korean War [1950-1953] is the most telling example. After a period of time with a poor diet, his fellow prisoners of war began to show signs of beriberi, a disease that results from a severe thiamine deficiency. After contacting the Red Cross, they sent him some vitamin B1 in the synthetic form, Thiamine HCL. What happened to his patients with the pure-crystalline fraction? They continued to decline. In fact, the plague worsened until that same doctor listened to a couple of guards who told him that rice polish (known today as rice bran) could be used to alleviate the symptoms. The doc started feeding his patients the rice polish one teaspoon at a time. Within a short period, his patients’ improved and the beriberi plague ceased. Bottom line is that nature’s nutrients are packaged to perfection. A simple teaspoon of rice polish outperformed a high-dosage, synthetic compound. Does this mean we have to throw out our supplements altogether? Not so fast. First we need to know the difference between whole-food concentrates and synthetic supplements. It’s all in the label. Read the ingredients. The ingredients tell it all. If a nutrient is listed as a food like liver, pea vine, or alfalfa, you’re good to go. If there are chemical names like niacin, thiamine, or tocopherols, throw it out. In nature, B vitamins come from the likes of nutritional yeast and liver, not niacin or thiamin. Vitamin C comes from green leafy vegetables, citrus, and buckwheat juice, not ascorbic acid. You’ll find vitamin E in wheat germ oil and pea vine, not in tocopherols. Look at the DV percentage. The percentage of Daily Value is based on chemically pure vitamin fractions. If the nutrient on the label is listed at 100% or more, you know you’ve got a synthetic product on your hands. Remember, nature is low dose but highly potent. Beware of singular vitamins. Mother Nature works in tandem. Her nutrients are never found alone. If you’re taking a supplement all by itself, such as vitamin E or D, it’s guaranteed to be synthetic. Don’t buy the hype.The supplement industry is an industry just like anything else. Major supplement manufacturers often sponsor studies and/or donate money to research programs at universities likely having some influence on both the study design and the results and conclusions reached. The simple truth is that profit margins are much higher when manufacturers replicate standardized compounds rather than go through the careful, labor-intensive, more expensive process of compounding whole foods. As always, it’s great to hear from you in the comment section. I wonder, what’s your experience with supplementation? Tell me, have you had great success taking a supplement or have you noticed your health starting to slide? Want to know my favorite vitamin? Vitamin R. Vitamin R is the least expensive vitamin that you can find on the market. It’s not one that’s really talked about all that often. It doesn’t even come in a box, but wowzer- it is a super healer and it’s really potent at this time of year. Vitamin R is that rare vitamin that we all need. It’s the vitamin that supports repair and rejuvenation and it’s known as rest. There is something to be said about putting yourself out there in the world. To accomplishing things and doing your work. There is also something to be said for taking a break and falling into deep rest. We all get caught up in the hustle and bustle of this time of year. We’re all trying to make special moments for the loved ones in our lives and that takes a bit of effort. But, there is a deeper calling at this time of year. Do you feel it? It’s the calling of the darkness. The darkness beckons us to break free from our patterns and our doings to spend a little more time reflecting. As women, we are constantly doing for others. We give to our children, our mates, we extend to our friends, our neighbors, and our communities. And from time to time, it is so important that we take a break to give deeply to ourselves. Truly, truly, we can only give as much as we are able to receive. I just wrapped up the last hormonal healing circle with 13 amazing women. This was the first time that I offered my work in this circle form. And, it was truly transformational. One woman’s thyroid nodules are shrinking, another busy mom has dropped weight and changed her eating patterns, a third gal is cycling regularly, and a forth reports that she has finally broken through her hormonal stuckness. I am so proud of all the women who joined me over the last three months. They have taken their health into their own hands and now they are glowing in the results. I am a big believer in “right” timing. I know you’ll know when it’s your time to take your health into your own hands and learn how to balance your hormones for good. If you’re feeling the call to go deeper, I am right here ready to be your guide. In the meantime, I hope you can take some time off during the holidays and spend a little time replenishing your store of Vitamin R.
Buckle in folks. This is a long post that will add years onto your life. No joke. Did you know that most supplements are synthetic? The marketing mavens have us all tricked. Some people might even say that we’ve been hoodwinked. Supplements are totally natural aren’t they? There’s a whole bunch of junk out there when it comes to the supplement market. Yes, supplements are a market just like anything else in our society. And it just so happens, that the supplement industry is a billion dollar market. Last year alone, Americans spent about $1.5 billion on supplements. That’s a whole heck of a lot of money on the line. And here’s the heartbreaker, most of these manufacturers are in it for the cash and do not understand the human body. I really don’t like being pessimistic about these things, and it’s really important that we understand what we put into our bodies. Our health truly depends on it. Despite the natural looking label most supplements are made far, far away from the blue sky and the green grass. Most supplements are made in laboratories from chemical parts. You see, back in the 1930’s, the FDA declared that food has no medicinal affects. White bread is no different than wheat bread and sugar candies are no different than an apple. They did acknowledge that “parts” of food seemed to have some promise. Essentially, the higher ups concluded that beta carotene- a vitamin found in a carrot- has more biochemical activity than the actual carrot. Suddenly the laboratory experiments were on and they started “making” these components. Did you know that ascorbic acid (what we’ve labeled as vitamin C) is made from corn syrup? How about the fact that most B vitamins are made from coal tar derivatives? Wait, there’s more. Even Wikipedia announces the sham in their definition of a vitamin. I don’t care how they package, wrap, or sell it. The stuff that they “make” does your body no good. Synthetics are loaded with “macrochemicals” that require micronutrients. Do you really think that the betacarotene in a carrot is absorbed into the body all by itself? Heck no! It needs a full array of enzymes, co-enzymes, minerals, trace nutrients and more. We’ll never know all the active nutrients in a carrot that activate and make that betacarotene bioavailable. Here’s the real down and dirty. When you take a synthetic vitamin, your body has to supply all those accessory nutrients. So yes, you might be getting a high volume of chemically manufactured betacarotene, but you’re also sucking extremely high volumes of micronutrients right out of your system. In the end, your system will suffer. Read the ingredient label so you’ll know if you’re taking a synthetic, chemically manipulated vitamin. If you see food listed like liver, pea vine, or alfalfa- you’re good to go. If you see chemical names like niacin, thiamine, or tocopherols- throw it out. Yes, B Vitamins come from the likes of nutritional yeast and liver not niacin or thiamin. Vitamin C will like green leafy vegetables and buckwheat juice not ascorbic acid. Vitamin E that is found in wheat germ oil and the peavine plant not tocopherols.